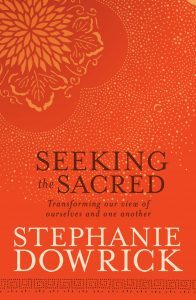 Sydney, Melbourne, Adelaide, Perth, Auckland, Maleny, Brisbane, Byron Bay…Sydney – are just some of the cities and towns Stephanie Dowrick will visit to talk about her brand-new book, Seeking the Sacred. A list of events follows that will be constantly updated in the coming weeks. Location: Esso BHP Entertainment Centre 100 Foster Street, Sale, Vic. This will be a major event with a chance to hear in detail the profound social implications of a more personal discovery of the sacred. Aquinas Academy, Crypt of St Patrick’s Church, 141 Harrington Street, Sydney. 5.30 for 6pm. Free but please note limited places only. Come early for prompt start. This is Stephanie’s sole NZ event. Cost: $35, Group discount, $30. Bookings: 07 3846 3422; 07 3229 4677; 3367 8526. Stephanie will be in conversation with musician, academic and spiritual practitioner Kim Cunio, offering an exceptionally beautiful chance to consider “the sacred” and its applications in everyday living. Location: 49 Glebe Point Road, Glebe. Gabrielle is a psychotherapist and editor of CAPA Quarterly. This promises to be a very lively conversation exploring where the spiritual can take us, perhaps “beyond” the insights and strengths of psychotherapy and ethical humanism.